Looking for a spacious flat in Glasgow's trendy Merchant City with parking? This could be for you! 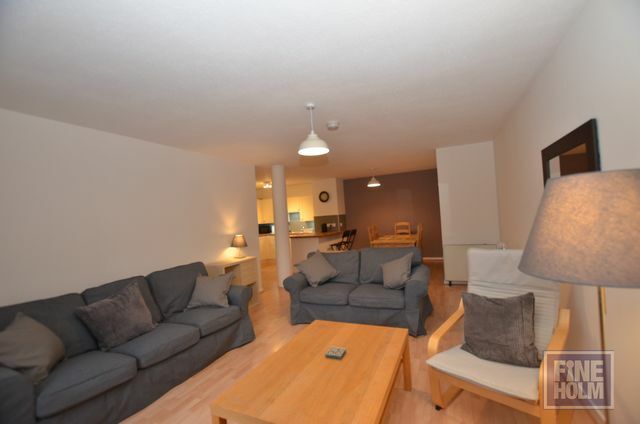 Freshly decorated and with a newly fitted kitchen this large 2 bed flat is a definite contender! Located within this converted warehouse, with resident parking available ( first come first serve basis) it has large entrance hall with cupboard storage space (washing machine fitted in cupboard) , fresh shower room with double shower enclosure, 2 large bedrooms both with fitted wardrobes, and generous open plan kitchen/living /dining area with newly fitted kitchen, breakfast bar area, dining area for 6, through to separated living area with lots of seating space and attractive views out. Newly carpeted and decorated throughout. Electric heating. Resident Parking.